"Like looking for a needle in a haystack, when you don't even know where the haystack is." The words of the former harbour master of Guernsey regarding the task of finding Cardiff City striker Emiliano Sala were stark. "I've been in football management now for 40 years and it's by far the most difficult week in my career by an absolute mile," stuttered the wizened and normally pugnacious Neil Warnock, the Bluebirds' manager. The vanishing of the Argentine striker en route from Nantes to Cardiff a week ago, somewhere near the Channel Island of Guernsey, has transcended a mundane tale of a crashed light aircraft and turned into something of huge spiritual importance to the global football family. For despite the manifest hopelessness, hope is refusing to quit. Against all logic, the search for Sala goes on, buoyed by a social media campaign which has yielded €300,000 in donations, including some from famous players like Kylian Mbappe, enough to procure the use of a submarine and surface vessels. The quest for the missing footballer has become an affirmation of shared faith from a sport sometimes dismissed by outsiders as lacking profundity. Maybe it usually does, but the reaction to Sala's disappearance makes perfect sense to those in the know. "Deep down in the bottom of my heart I know that Emiliano - who is a fighter - is still alive," said his sister Romina at a press conference four days ago, having jetted hastily and tearfully to Britain. As long as we believe Sala is out there somewhere in the Channel we will keep looking for him because he was one of us and we look after each other in times like these. Ask anyone who has been in the military - you leave no man behind. As children we all dreamed of being goalscorers like him, players with the privilege of pressing the ecstasy button of hitting the ball into the net. This tragedy has tapped into something from our childhoods, put simply the love of football. The need to feel tribal is innate and intrinsic to this sport's following. Win or lose we all take the same journey. Take that drug away and football folk will seek it elsewhere; it is a fire which cannot be dowsed. Romina's determination to keep the flame burning therefore makes perfect sense. Sala's unexpected vanishing struck a sudden chord across the soccer world. Radamel Falcao, Diego Maradona, Lionel Messi and the Argentine President Mauricio Macri amongst others tweeted pleas for divine intervention or a renewed search of the English Channel. In a supposedly secular age, Twitter resembled a book of prayer intentions with the hashtag #NoDejenDeBuscar - Don't stop searching. In Nantes, the city Sala had departed after four happy years, Place Royale became a shrine overnight to the lost hero of Les Canaris, full of candlelit vigils. Outside the Cardiff City stadium too, fans who had never seen Sala play and never will draped votive offerings of scarves, flags and daffodils to their eternal Bluebird. Football as religion? It sure looked like it. The French and Welsh cities are twinned anyway through a shared Celtic heritage. 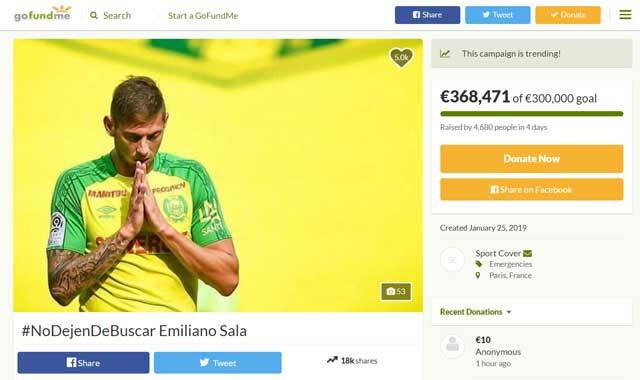 It is hoped that Sala will bring their football teams closer together in future, perhaps through a regular charity match and fan association, the human symbol of their fraternity. And as for the man at the centre of this devotion, will he ever know his fame, the cult his mysterious disappearance has engendered? One minute he was a footnote in the January transfer window en route to a relegation-threatened struggler, the next he was of the world's best-known players. No black armbands were worn at the weekend despite the probability to the contrary so in challenging the laws of physics, the missing plane has assumed a Bermuda Triangles-esque character, open to magical interpretation. Tonight at Arsenal, Cardiff City's team sheet included Sala's name at the bottom of its list of substitutes, a spirit player no plane crash could stop. "I am very happy that the searches are now continuing," he wrote. It is still a deeply sad story, but tragedies bring out the best of humanity in those who react with love and solidarity. What a strange and infathomable thing fate is and what an emotional and sacred thing football can be.